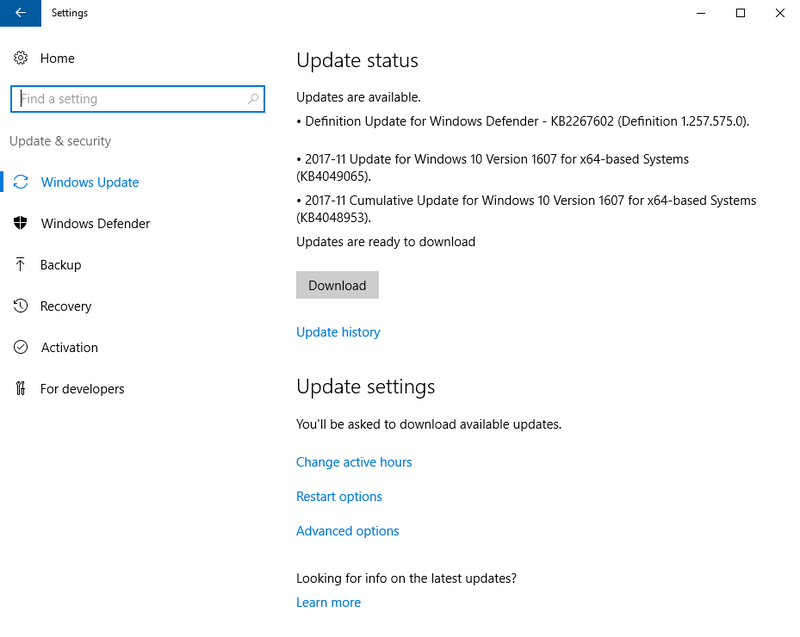 After you install updates with BatchPatch (or with any third-party tool or script) you might notice that if you then look at the Windows Update control panel GUI on a Windows 10 or Windows 2016 target computer that it will not usually be up to date. Instead it will display stale, cached search results that are no longer accurate after applying the updates with BatchPatch. You can close and re-open the GUI over and over, you can restart the Windows Update service, and you can use the ‘check for updates’ option in the interface repeatedly, but still the GUI will display old search results that are no longer valid. In reality this is just a cosmetic issue. However, we have some users who for one reason or another need or want this GUI to always reflect the current status of the available updates on the computer. In previous versions of Windows prior to 10/2016 this was not so much of an issue because you could initiate a new check for updates on-demand in the Windows Update control panel GUI. But starting with Windows 10 and 2016 it’s no longer an option. And if you tried using the command line action wuauclt.exe /detectnow or wuauclt.exe /resetauthorization /detectnow or wuauclt.exe /reportnow you would have noticed that those commands don’t seem to do anything in 10/2016. In Windows 10/2016 there is a new command line utility UsoClient.exe that can be used to resolve this discrepancy. 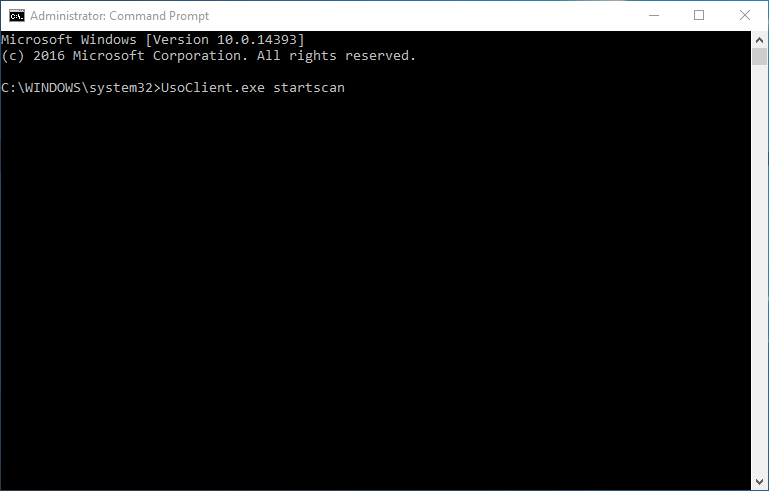 This Microsoft blog posting explains that we can use UsoClient.exe startscan from an administrator command prompt on Windows 10/2016 to effectively replace wuauclt.exe /detectnow. This posting exposes some other switches that apparently exist for UsoClient.exe, though at the moment I’m not sure how useful the other switches will be for most BatchPatch users, and I have not tested those other switches either, so I can’t comment on what they do or if they work as described. In a future version of BatchPatch we will likely add some hard-coded options for UsoClient.exe to be easily executed, but in the meantime if you want to use BatchPatch to execute UsoClient.exe on target computers, you have a couple of options. First, I would recommend that you hard-code the command (UsoClient.exe startscan) into your BatchPatch installation using the instructions posted here. Once the command has been hard-coded into your BatchPatch installation you will be able to execute it on-demand for target computers in your grid at any time, but you can then also easily add it to job queues. If you are one of those users who really wants or needs the target computers’ Windows Update GUI to be accurate at every moment, then you might consider appending the UsoClient command to the end of a job queue that downloads/installs updates on your target computers. This way you could ensure that after updates are installed the GUI on the target computers will reflect the current state rather than showing stale information. This entry was posted in Blog, General, Tutorials and tagged UsoClient, windows update, wuauclt. Bookmark the permalink. Both comments and trackbacks are currently closed.